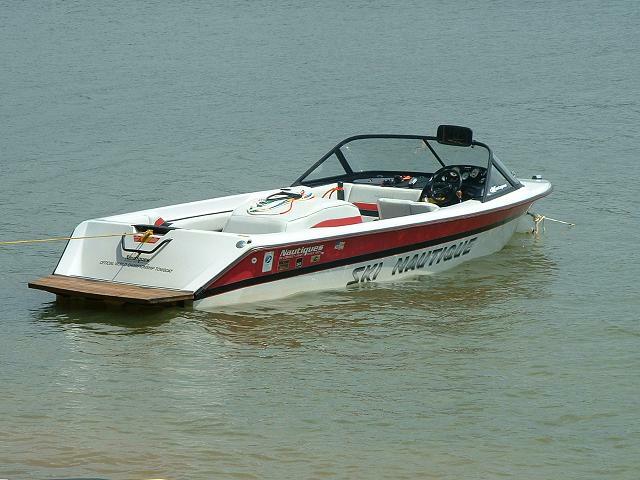 Just Picked Up a TWIN-ENGINE Fish Nautique! I just got home from picking up one of the three Fish Nautiques ever produced with twin engines! Can't wait to get started on this thing! This one is a 1981, and the previous owner says that it was the first one built. I have not been able to verify that yet, but I am working on it. I think one of the others is a 1980, but I am not positive. The previous owner started a very nice restoration. He removed the floor and replaced the stringers with all new composite stringers, and gelcoated the entire bilge. This work looks great! He also installed a custom-made 75 gallon fuel tank that will be under the floor (instead of at the transom), and modified the deck a little to open up more space behind the console. This work looks very good! The original 3.8L V6 engines were completely remanufactured, and it looks like the work was very nicely done. The bright work is removed from the boat, but most of it was stored in a shed and is in decent shape. Unfortunately, the previous owner got sick and was unable to complete the restoration. The boat sat outside since 2014 just south of Ft. Lauderdale. It was not covered, and someone removed the carbs from the engines. Someone tried to cover the intakes with plastic bags and rags, but that didn't work. The bags deteriorated in the Florida sun, and the rags offered no protection from water. The engines have zero hours since rebuild, but they are both completely locked up now, and will need to be rebuilt again. The center console is complete, but in need of restoration. So, the plan is to get the engines rebuilt again, install the floor and spray new gelcoat on the floor and entire top deck, restore the console, mount the gauges, rewire everything, and get it in the water! Here are some pictures from the restoration work the previous owner did. I'll add some current pictures in the next post. Here are some shots from yesterday when I loaded it up on my trailer. real bummer that the motors need a rebuild so soon, they looked perfect. nice find! wow, that thing is gonna be incredible! 2003 SANTE - "OG 210"
Started going through a few of the boxes of parts that came with the boat today. Lots of gauges, filters, thru-hulls, pumps, etc. Kinda digging these gauges. Maybe I'll install these. Thoughts? So where is your Miss Budweiser Fish Nautique? Whoever started the restoration on this one was thorough - it looks like you'll have a new boat when you're finished. Very cool. That boat is bigger than I thought. Helps seeing it behind your Excursion. How long is it? The Bud Nautique is in the water here at Lake Norman. Not getting rid of that one. At least not until this one is finished. The Fish Nautiques are all 23' (really a little longer with the platform and the anchor pulpit that goes on it). The Fish Tiques are all 20'. Last edited by gary s; 07-13-2017, 03:57 PM. Yeah, I talked to Reid quite a bit about it before I went down and grabbed it. Art would be a great resource though. I'll try him. Those are the other two that I know of. I have pulled as many pictures as I can find of those two to keep for reference. It's in good hands then . You trying to corner the market on Fish's ? Art told me once that they could build 2 Nautiques in the time and space a Fish took at the old factory,one of the reasons they quit building them. He will be a great resource. Not really. I just couldn't pass this one up when the guy dropped the price. The previous owner did some nice work. Given what you can do, I am anxious to follow this one. Keep the posting of the progress. What an incredible boat! Twins! Cool boat. Looking forward to see it come together. At at first glance I thought the engines were GM small blocks but then I realized they were V6s. I didn't expect that. Cool project. I am real curious how it will perform.